New York City is not only America's metropolis, but arguably the world's. It is here, in Manhattan, that the historic Nat Sherman Townhouse has thrived for nearly a century. But Nat Sherman is much more than an upscale tobacconist, the company has been well-known for its own brand of premium cigars since the very beginning. Among the company's most famed cigars is the Metropolitan Selection, a brand that proudly speaks of Nat Sherman's history in New York City. 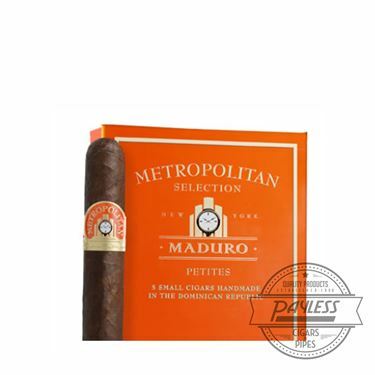 Metropolitan was introduced during the great cigar boom of the '90s, using contrasting wrappers of dark (Connecticut Broadleaf) and light (Connecticut Shade) over a mild interior recipe of Dominican tobaccos. Years later, Nat Sherman updated the cigar's look, added modern sizes (read: gordo), and expanded the Metropolitan Selection brand to include a more intense experience from a hearty blend of Nicaraguan tobaccos. With the addition of the Metropolitan Habano, the line now spans a full range of light to dark, with a smoking experience for nearly every self-respecting metropolitan (or even suburban, for that matter...).